Pretty pointless for any adult collector. I know, right? It's almost like they're $13-$30 toys made for small children and not $100+ full-scale prop replicas for fully grown 30 year olds or something. This isn't the first time that there have been PR roleplay toys in that kinda scale. Hell, there's been a lot smaller before. This isn't everything obviously, just part of the roleplay line. There's more on the way. Did people just forget amidst the Legacy line that Power Rangers' primary toy sales are for kids and kid products? A good number of people have seemingly never understood this in the first place. Regarding the morpher toy whatever or however it turns out to be, please please please be one complete package with no extra bits to buy (which are difficult to find), just to be able to morph into favourite ranger etc. I wonder if, the power rangers being spies, the are like the trànsformers... rangers in disguise :p if they will come with a tech specs decoder in the package like Transformers used to. Judging by the Red Ranger's weapons, it looks like they're foregoing the espionage theme in Beast Morphers in lieu of an "animals, but high-tech!" angle. I wouldn't expect much in the way of courting the espionage theme. Is that really the final "Sougan Blade" toy we will have, because I really liked the details it had and with the binoculars in Go-Busters. I agree. The red ranger stuff, all looks more like jungle fury. Nothing wrong with that. It is s surprise to me. Halloween costumes have popped up and they actually look good! Glad to see they included Yellow too. I know they generally always have a female ranger costume but moving into a new arena it's never a given. If I sat in the bath long enough, do you I could shrink enough just to fit in one of those? Third party costume makers e.g aniki(sp?) etc will probably start making costumes for the older fans. Will anyone be buying one? Nah, you're thinking about it all wrong. Soaking will just make you bloat as you absorb the water. What you need to do is go the cartoon route; find some gym's steam vat thingy, where you sit in it and your heads sticks out, then they steam your body into a shrunken mini version, haha! I think I might, actually. This uniform looks like it would be a bit more forgiving for the body. And bonus- you can probably get a custom color suit. Sorry. 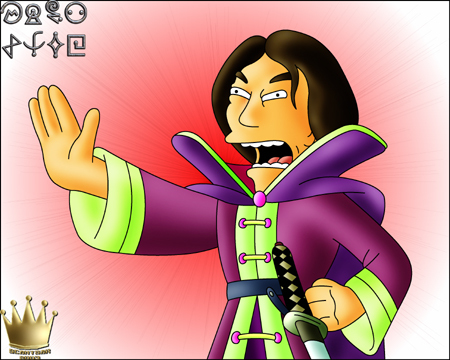 Eversince I saw that that degitizer astro morpher with voice activation, and people having trouble with it, Koji from Iron Cook, Futurama cartoon pops in my head. *People trying to get it to work, "Installllllllllllllllllluuuuuuuuuuuuuuu!" P.s I'm really excited to see the toy morpher. I am not only praying it is a complete morpher without having to try get impossible to find extra items to get it to work, but now in my mind also, I hope it isn't voice activated. Last edited by Red Rock; February 8th, 2019 at 07:35 AM. So, is that the actual megazord toy, or is it sort of one of those stylised megazord action figures with poseable arms etc? One is the actual Megazord, one is a combined only sound Megazord and one is the Wild Force Playskool Megazord. So Great Go-Buster looks decent. Missing paint, to be expected, but the wheels are very similar to what Hasbro is using on the Studio Series Transformers. Particularly Optimus. This should be interesting to see. Per Jason Bischoff the DLX Beast-X ultrazord. Yeah, I can see that. They do that with TF's quite a bit. Set versions with less paint, but the same ones, individually with better paint apps. I really, really wouldn't be surprised.